Your browser does not support inline frames or is currently configured not to display inline frames. GRAPHITE METALLIZING CORP - Graphalloy provides simple solutions for tough high temperature bearing problems. GRAPHALLOY, graphite/metal alloy, is a unique self-lubricating graphite bushing and graphite bearing material that offers superior performance in hundreds of mechanical and electrical applications, particularly for high temperature bearings. 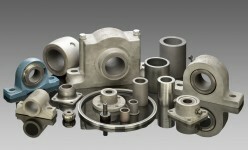 GRAPHALLOY, graphite bearing and carbon bearing materials, for high temperature and submerged applications, come in standard and custom designed graphite bushings, graphite bearings, and pillowblocks to provide lifetime cost savings and significant operating advantages over conventional bushings and bearings. Metallized graphite and metallized carbon materials for high temperature bushings and bearings. Typical materials and applications for which GRAPHALLOY bearings are substituted include graphite bearings, metallizing, self lubricating bearings, high temperature bearings, metallized, carbon , graphite bushings, self-lubricating, bearing, bushing, high temperature, carbon graphite, graphite-carbon, graphallast, graphlon, peek plastic, metcar. GRAPHALLOY®, a graphite/metal alloy, is a unique self-lubricating bearing material that offers superior performance in hundreds of mechanical and electrical applications. GRAPHALLOY standard and custom designed products provide lifetime cost savings and significant operating advantages over conventional bushings and bearings. Requires no grease or oil. Permits continuous operation and eliminates downtime. Works at high temperatures where oil-based lubricants burn off or oxidize and plastics fail. Operating temperatures to 1,500º F / 800º C (in non-oxidizing atmospheres). Will not gum or seize. Does not congeal or solidify at low temperatures or cryogenic conditions. Maintains self-lubrication. Works without lubrication. Survives run dry applications. Eliminates galling or seizing in hot and dry conditions. Will not attract dust. Operates submerged. Will not swell or wash out. Withstands a wide variety of hostile fluids. Does not cold flow or deform under pressure. Maintains its size and shape. Insoluble in most industrial liquids. Works in acids, alkalies, hydrocarbons, water, and liquid gases. Constant, low coefficient of friction. Not just a surface layer, solid throughout. Maintains lubrication during linear motion. Lubrication is not drawn out and dust is not pulled in. Eliminates sparks and static. Conducts well. Accepted for food services. No lubrication to drip or cleanup. Easily steam cleaned. It is easy to install GRAPHALLOY bushings in metal housings, once you know how.